Before you start silk painting it is useful to turn inwards and relax for a little while. Some people meditate, some find delight in observing works of art, others admire something nice (a plant, a sleeping child) – the point is that your thoughts should not ramble and that you should be open to receive all the beauty that awaits you. If you already have the base kit of silk paints, contours, brushes of different size, genuine silk material – then start your trip to the world of silk painting by trying them. First of all it is useful to strech the silk (unless you have a so-called window picture – where the silk is already streched and fixed on a stiff wire frame) so that you can work on a nice flat surface and keep the silk away from the desk you work on. An old picture frame will do – you can fix the silk on it with thumbtacks, just pay attention that you don’t make it wavy. (Tripedal thumbtacks are the best choice) A special silk painting frame would be the perfect solution (with this the silk can be further streched during painting) – this, together with many other accessories, can be found in hobby shops. You can test and compare different materials right at the beginning (the back of a silk shirt, a second hand kerchief etc.) – just remember, it is important to use genuine silk. As a start you can try the following painting techniques to be able to decide which one you like, which one fits to your ideas best. This technique can be used for thin and thick silk as well… and gives you incredibly rich variations. If you paint different colours close to each other with a thick brush – the colours will converge and give you wonderful colour transitions. If you use a thin brush and let the paint dry you will get unique patches and lines. The material can be steeped/watered with a brush before painting. It should be only wet, not „flooded”. This way it is easier to merge the colours, however they won’t be as intense as they were if you used the first technique. This thick paint usually comes in some kind of applicator tube, and it can be used for drawing resist lines that stop the flowing of the paint on the silk. If you find the line too thick you can use a metal tip – the thickness of the lines can be set precisely with this device (it comes in different sizes) but washing it is a hard job (easier if you don’t let the paint dry on it). The paint will be contained within the contoured resist area – unless the lines are discontinuous and there are tiny gaps in between. It is very rare that anyone manages to make the resist lines nice and equal for the first time – but you will improve if you practice. When the contours are done, it is worth letting them dry otherwise the lines can be blurred. You can help with a hair dryer – drying takes only five minutes this way. The next step is colour painting – you are already familiar with the „behaviour” of diluted paints. It is enough to make a dot with the paint and it rushes as far as possible, up to the resist lines. Prepare a surface full of nice colour patches. Don’t let it dry, but draw lines or make dots on it with a wet brush. Then you can salt it… Use coarse-grained common salt or try the so-called „salt effect”, a special kind of salt that also consists of big grains. You can make different variations: salt an area thoroughly while another area only very lightly… you can make strips as well. Finally watch as the paint dries. It is very exciting! Let’s jump into silk painting! At the beginning you probably might not want to draw the mandala yourself (by the way: why not?) but choose a template. It can be set to the desired size with the help of a photocopier. To prevent the silk from slipping while you work, it is useful to fix it to the template before starting to paint the contour lines. The silk is transparent, you can draw the lines on the template with a black marker to make them visible through the silk. Another solution: pre-draw the lines on the silk with a vanishing marker (it dissolves in a few days or if it gets wet). You might consider it useful because you will feel more at home with the template pattern so drawing the contours becomes easier. If you skip this step start drawing the mandala with the gutta paint following the lines of the template under the silk. You can turn the silk, adjusting its position, to be able to draw the resist lines most easily and correctly. When drawing is done, take off the adhesive tapes and dry the gutta. 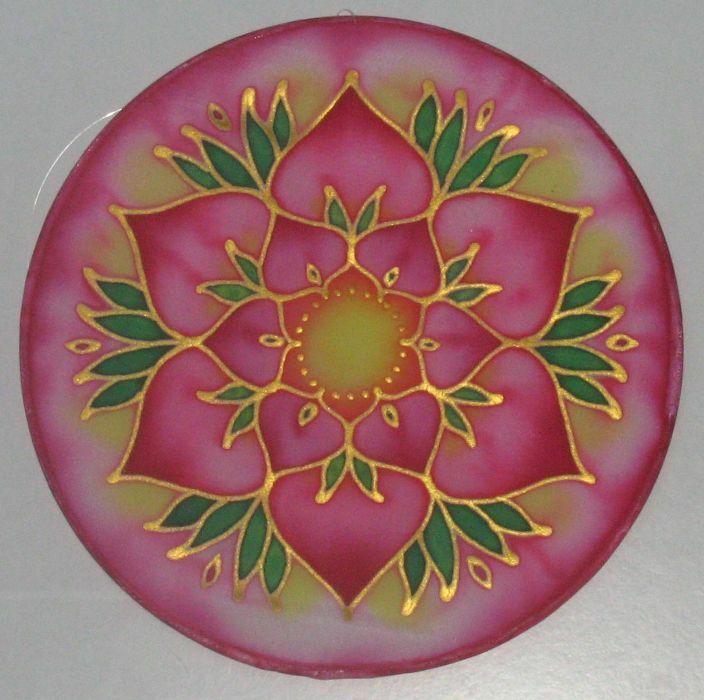 Painting: if you proceed from the inside of the mandala towards the edges, changing the colours from lighter ones to darker ones, the mandala will have a radiating effect. You can use the different shades of one colour next to each other and create beautiful colour transitions this way.